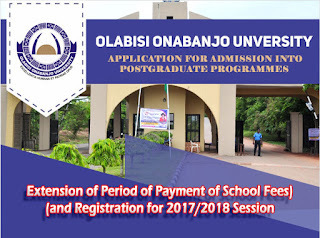 The Olabisi Onabanjo University, [OOU] Postgraduate School Extension of Period of Payment of School Fees and Registration Deadline for 2017/2018 Academic Session. 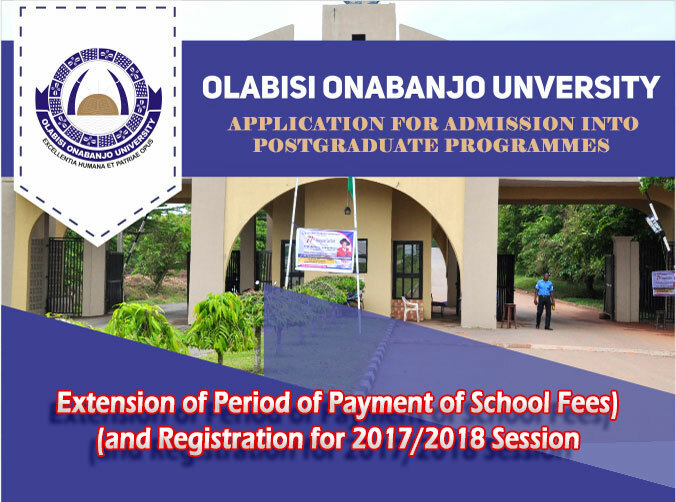 The Authorities of the Olabisi Onabanjo University, [OOU] Postgraduate School has approved the extension period for the payment of school fees and registration deadline for the 2017/2018 academic session. In view of the numerous appeals received from Postgraduate Students; the Management of the Postgraduate School has approved the extension of deadline for payment of School Fees and Registration for 2017/2018 Session . The New Payment of Fees and Registration Deadline of the Postgraduate School is on Wednesday 7th March, 2018.